You survey your tiny colony in the frozen, snow white wasteland. The new home of the survivors of London in this ice age, post-apocalyptic world. And you are faced with the problem of not having enough people to work and the grave dilemma of passing a law to put children to work and increase the colonies chance of survival or creating a shelter for the children and hopefully, one day educate them. Once you pass that law, there’s no going back. You hand hovers over the two laws, contemplating the pros and cons of survival and what the cost of that survival is. 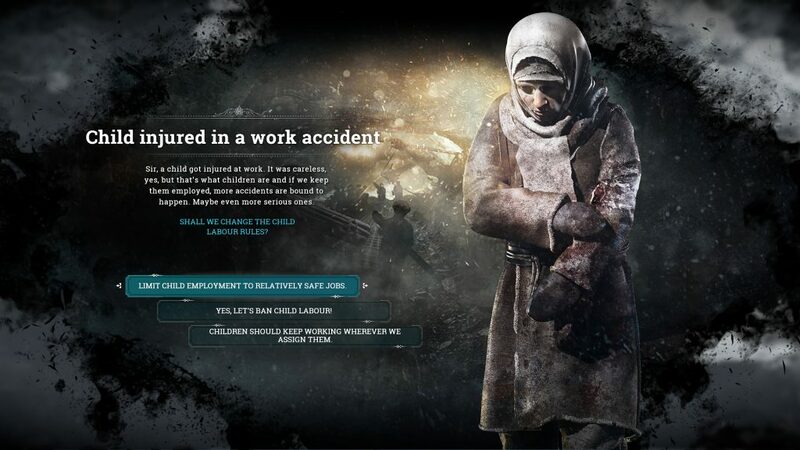 You make your decision… Frostpunk is the latest game from Polish developer 11bit Studios, where you are the leader of a small colony of survivors known as New London, in a post-apocalyptic world that was hit by a severe ice age. As the title suggests, it’s a frozen, frost-encrusted steampunk world, somewhere at the end of the British Industrial Revolution, at the cusp between the Victorian and Edwardian periods. At the core of the city and the gameplay, is an enormous coal powered generator, the heart of the city and the one thing you must keep going if you want your colony to survive. You build around it, creating dwellings, food huts, public houses, medical stations and research areas. Your basic city builder simulation in that sense. But what makes this one different are the moral decision you must make in order to survive. As the short parable at the start illustrated, you are quickly met with the conundrum of the Industrial Revolutions question around child labour. Do you choose “safe” manual labour or do you choose the route of apprenticeships, a more educational form of labour really at that point in time? Either one helps survival, but one is the more long-term. And its this representation of moral storytelling and I wanted to explore. Having played it for a few hours, I’ve had various moments of emotional and rational quandary around the game. How effective and ineffective is it when trying to deliver these issues narratively through its gameplay. What I must also mention is that this isn’t a review of the game or gameplay in a strict sense, but rather a short analysis of an experience that I have had with it. For reviews of its quality of development, I would suggest looking at more mainstream websites. One mechanic or aspect of the game that you are immediately presented with is the Book of Laws. Every 24 hours in-game time, you are able to pass various laws. Usually, either/or situations, once you have chosen that law you cannot choose its other variation, much like the child labour versus child shelter law. And these laws branch out to further refinements of the initial one. It is the fact that they become the written stone that the laws become moralistic issues. At this point in time, it may be necessary to put children to work because the colony must survive. But you personally don’t feel that children should be subjected to that, they should really be kept safe and educated. But you can’t have it both ways, you must make the choice. Bear in mind that the game doesn’t last years, but only a few months of in-game time. Every time you choose a law, the AI greets you with various messages of the feeling of your colony, some are discontent, and others are hopeful. The narrative of the dialogue gives you a sense of how your choice was met. It is also graphically portrayed with two bars that show the average of discontent and hope. The AI will also offer requests and objectives from your citizens, giving flavour screens of the plight of your people and what to do to help them or ease their suffering. Each of these flavor moments is story elements that portray the people’s frustrations, reservations, acceptance of reality and melancholic gratitude for your leadership in this icy wasteland. They try to add a face and a humanity to the tiny sprites that walk over the wood boards in the slushy snow, or the ones pushing and struggling through snow drifts to harvest precious coal to keep the fires burning. But you only ever view them from a bird’s eye view, as if a god of some sort, choosing and deciding their fate. Perhaps an apt description, considering its environmental theme, but the game’s narrative quickly, at least for me, pushes into an area of having to make cold, hard decisions to ensure the survival of New London. After the initial 20 days or so, you suddenly realize that the decisions you are making are no longer around the overall comfort of your small handful of survivors, but rather to maximize the survival and output of your couple hundred of survivors. The game has fast forward, play and pause mechanic, and very quickly you are using the fast-forward to get through the long cold nights and to the next research or law that you can pass. I found that this need to speed up is accentuated by the telegraphed time-line of when certain weather events will happen. You have a very specific weather forecast that the temperature will drop by so many degrees. What this does I found is that it rationalizes your decisions far in advance. The decision is made for you almost because we needed heaters because we know it’s going to get cold. I would have preferred a vaguer narrative element of a forecast warning us that in roughly 8–13 days the temperature will drop, but we don’t know how much. A random event that required you to be prepared, and forces you to make the tough decisions, without having all the information, and hoping you made the right decision. Did the ends really justify the means then? The ends justifying the means is accentuated with a secondary choice in your books of laws. Once you reach a certain you are able to make the choice between Law and Faith. In my opinion, it’s a varying choice between oppression and manipulation in different forms. But it does feel that at times, that once you’ve made up your mind around “winning the game” rather than ensuring that your people should survive, the choice of what to choose becomes very easy. Take the Law and Order choice, without spoiling too much, it unsurprisingly allows you to go down the route of an oppressive police state. And from what I’ve understood from the developers, it is an intended slow descent into the choices that bring about fascism. Which I find an inspired concept, but the nuances may be lost of the Competitor persona type, who simply wishes to beat the game. The unfortunate outcome of wanting and the ability to “beat the game” is emphasized by the very literal removal of the player from many of the emotional aspects it tries to present. It’s narrative hooks of grabbing the emotional state of the player I feel are hampered somewhat by the birds-eye view of the player. It is unfortunate that you can never fully zoom into a street-level view and truly see and experience the horror of having to live and survive in the frozen squalor that the people of New London need to. Some may feel their heart string being tugged from a distance, but many may not, due to this distance. But I do understand that this may not have possible in terms of development for the studio. Another issue that removes the player, but only after an initial playthrough is the linearity of the experience. Naturally, there is a story and the developer wishes the player to discover it, step by step. Unfortunately, on the second or third, or etc. playthrough the story is no longer emergent. The scouts you send out to discover the wasteland will always meet the same challenges, often with the same outcomes. My emotional connection with the possible scattered survivors that I needed to rescue become moot, as I knew they would be in the same state whether I went to save on the day 15 or day 25. A regrettable outcome of a linear narrative, but often understandable and unavoidable. I personally would have preferred the emergent, random narrative, but that is a personal choice, and not everyone enjoys those. In the end, you are forced to make the choice of ensuring that as people survive as possible, because everyone, realistically wants to be the saviour of New London, and not be banished into the frozen wastes for the ineptitude. And naturally, everyone enjoys winning over loosing, even if it is at the cost fictional, digital, AI people. Though with that, all said, and the emotionless sense of beating a game over experiencing it, there is the realization, perhaps an epiphany from the game. 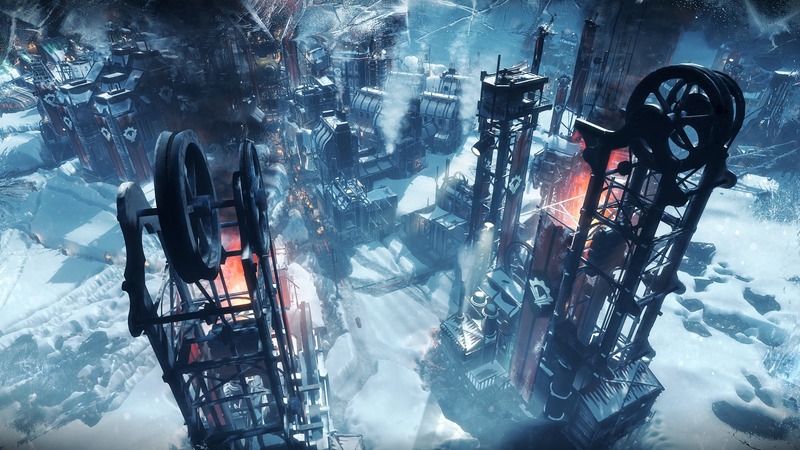 It is the awareness that regardless of it being a simulation or not, within the narrative world the Frostpunk shows us, that once your colony hits a certain size, that certain needs and responsibilities must be understood and met. And that this realization, in its dreadful reality is true of any city or nation, simulated or real. That when a population hits a certain size, it does indeed become a faceless mass, the player, the leader, president, prime-minister, etc. do become removed, and that the decision-making in such a situation does become about the majority, the greater good, and no longer about the happiness or comfort of the individual. I do intend to continue playing the game, I do still enjoy it, despite the linear issues I mentioned, and I do still need to play the other scenario’s available. I hope the developer continues to tweak and release more content for the game, as it is an interesting narrative world that has a great amount of potential. If you wish to play it, then I do highly recommend it and it can be found on most major platforms, such as Steam and GOG, and through various online retailers.